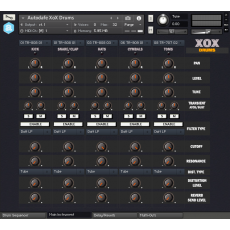 Autodafe XoX Box is a Drum Machine for Kontakt (FULL version of Kontakt 5.6 needed, it will not work on the free Kontakt player) based on samples of Roland Drum machines of the XoX series (606, 707, 808 and 909). All samples come from free sources and are believed to be free/public domain. Toms (Hi, Mid, Low) for a total of 12 sounds. Each Slot has different selectable kits of sounds: 28 Kicks, 28 Snares/Rim/Clap combinations, 12 Hats combinations (Closed, Open), 8 Cymbals/Cowbells, 8 Toms combinations (Hi, Mid, Low) allowing many different combinations of samples. Each slot has separate Level, Pan and Tune controls for fine editing and fine-tuning of the samples. Each slot has two separate controls for Attack and Sustain of the onboard transient shaper. Each slot has Solo/Mute buttons, to Solo and Mute sounds in the slot. Each slot has an independent selectable Filter: Filter Type (different LowPass, HighPass), with Cutoff and Resonance controls. Each slot has an independent Distortion section with selectable Type (Tube or Transistor) and Level control. Each slot a dedicated Reverb Send Level, which controls the amount of sound that is sent to the Reverb bus channel. DRM32 Analog Drum Machine has an onboard Drum Sequencer with 32 selectable patterns, as well as a dedicated Drum Delay and Reverb. The instrument will normally load as a stereo instrument, but can be switched to Multi-Output, with user assignable outs. To download the kit you simply have to put it in the cart and follow the checkout procedure. I kindly encourage you to make a small donation at the end of the checkout process for the free stuff you will download. At the end you will receive download links by email, if you register for an account you can access them anytime just by logging to my website (check "Your Account/Downloads" menu at the top).